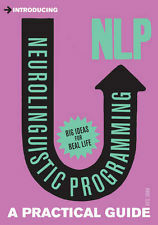 These days NLP books include MP3 recordings, of course. I was listening to Jack Canfield on The Teachers of the Secret (for the second time) encouraging his listeners to try new things when I heard something I had missed first time around – Find out about NLP he said. I recall thinking I’ve heard that mentioned before but I knew absolutely nothing about it. So I took the advice. I went along to Waterstone’s Bookshop in London’s Piccadilly and found the NLP Books section. I didn’t have a clue what I was looking for. Most of them appeared to be rather like mechanical plastic shadows of something: rather as if they had invented their own subject to preach about. Have a look at these reviews of NLP books I've read and liked. Hopefully they'll help you make an informed decision of what you'd like to read. 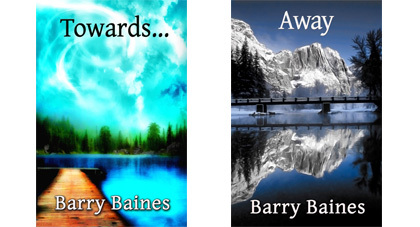 These two ebooks are available on Amazon Kindle. By NLP trainer Barry Baines they survey every day problems from OCD, phobias and fears to gaining confidence, wealth and success. Together they give you everything you need to tackle your daily challenges and drive your success. NLP principles are applied throughout. You have nothing to lose and everything to gain. Amazon Kindle can offer you a free sample of Towards Success or you can enter your name and email address in the box below and I’ll send you the first three chapters of Towards Success free. Then among the books my eyes fell upon Richard Bandler's Guide to Trance-formation: Make Your Life Great (Book & DVD) The American version is subtitled How to Harness the Power of Hypnosis to Ignite Effortless and Lasting Change. 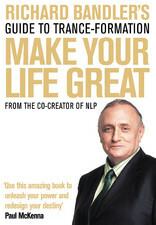 I noticed at once that Richard Bandler was described as “the father and co-creator of NLP” or neuro-linguistic programming. That is what I was looking for, an authoritative work, and what better person to go to than the originator himself. That was the NLP book I bought and it was the beginning of another powerful turning point in my life. If you want to know the NLP definition or to learn NLP this book is jam-packed with essential and, what is more important, authentic material about NLP. It also deals comprehensively with Hypnosis and the art of creating powerful learning states. At the end of the book can be found resource files on Anchors and Anchoring, Sensory Predicates, Submodality Distinctions, the Meta Model, Milton Model Patterns, and Eliciting and Annotating Strategies. Once you’ve read this book you will be looking for more. I immediately researched Richard Bandler and found that he was speaking in London a few weeks later so I booked in for that at once. And a few months later I attended my first NLP practitioner course run by Richard Bandler and John & Kathleen La Valle. But that is another story for another web page. Before you do anything else, buy this book and it just might make your life great! It is available from the NLP Shop and on Amazon. 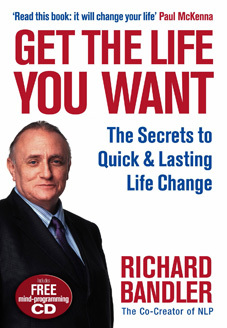 The version published by Harper Collins includes a great free CD and you can witness Richard Bandler’s hypnotic powers. In my view, the DVD alone is worth the price of the book. It is an easy read and distils many of Richard Bandler’s techniques. You can quickly use them yourself. If you are learning NLP - undertaking an NLP course, it is a great resource. If you have already qualified as a practitioner, it makes excellent revision. It is a book I can heartily recommend. Again, it comes complete with a DVD which makes it doubly worth the money. Find it on at the NLP Shop or on Amazon. Gregory Bateson, who adds a foreword, says of Bandler and Grinder: “They have succeeded in making linguistics into a base for theory and simultaneously into a tool for therapy.” Of course, we did not know then what inroads their NLP would make into the fields of psychology and human behaviour. Bandler, a modeller, and Grinder observed that although talented people like Virginia Satir and Gregory Bateson thought they carried out their tasks intuitively, they actually followed their own system. The books were designed to make therapists more effective by learning a specific set of questioning techniques based on the client’s verbal communications and learning how the use of particular non-verbal techniques may be indicated by verbal cues. If you are a serious student of language or wish to go into NLP deeply, The Structure of Magic Volume 1 and Volume 2 are available at the NLP Bookshop or, if you are lucky, on Amazon. You might wonder why I am including this book towards the end of the page when it's a book described as an introduction. The answer is simple and is rather similar to the person lost in the jungle who was searching for civilisation: I wouldn’t start here. The author of Introducing Neurolingustic Programming (nlp): A Practical Guide is qualified in hypnotherapy and counselling, and a licensed NLP practitioner. The book is a very good, brief summary of many NLP principles and I would regard it as an useful aid for anyone undertaking an NLP course. It is a sound revision guide and has a lovely section on embedded commands and weasel phrases. When I wrote “I wouldn’t start here” I meant just that. I wouldn’t start here because I like to have more flesh on the bones when I set out on the study of a subject. Having achieved some knowledge , however, it is a very natty pocket-sized book from which you can constantly refresh the principles and hone your skills. Again, I have no hesitation in recommending it, and it is available on Amazon. 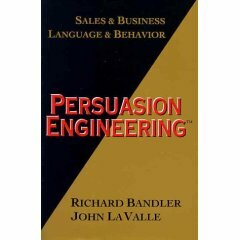 Persuasion Engineering is subtitled Sales and Business, Language and Behaviour. It bears a warning at the beginning: READER TAKE NOTE! While it may seem that some of the sentence structures in this book read as grammatically incorrect, they are written for a purpose, as NLP and grammar do not necessarily share the same structure. I think the truth is that the text is taken from a seminar of the same name. That DVD is available although it is much more expensive than the book. Despite what the warning says, my view is that the language suffers because it is a transcript of the seminar. True, some of it is for NLP purposes but other parts are too literally transcribed and intelligent editing would have made it easier on the eye. The fact that it is not an elegant read is the downside. That is far outweighed by the upside. Out of the NLP Books this book is a must for anyone who wishes to sell anything. If you think you are not a salesman, think again. We are all salesmen, no matter what we do. It is all about persuasion and how to get your own way. When you’ve read it, you’ll want to re-read it and then read it again. It deals with the basic stuff, rep systems, goes beyond eye patterns and reinforces anchoring. You will also find more great lines on precision elicitation including as well as Meta model/Milton model distinctions, motivators, the timeline and a whole lot more. It costs a little more than many books of its relative size, but you’ll get it back over and over again. 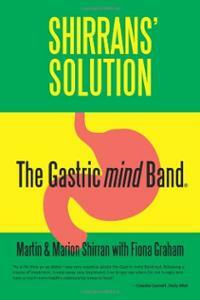 Shirrans' Solution: The Gastric Mind Band is my favourite weight loss book of all time and one of my favourite NLP Books. When I read it, I had been stuck for a considerable time at a rather heavier weight than I was used too and many of my clothes had been sitting around in the wardrobe for a long time because they appeared to have shrunk. Because of my interest in NLP – and probably because she was desperate – my wife bought me a copy which I read in a day. I adopted the techniques immediately and within a few weeks I had managed to lose 21 pounds which brought me well back within my desired weight range. Perhaps more importantly, I was able to wear those clothes again! The techniques outlined here will work for you whether you wish to lose 10 pounds or 100 pounds. Furthermore, there are no special diets and no food is banned. If you take the trouble to apply the principles, it will change your eating habits for good. There is no rigid calorie counting or fat points. You will be able to enjoy food and lose all the weight you desire. If you are thinking of having surgery to fit a gastric band, I implore you not to do it until you have read this book. Read about the disadvantages of the surgery and the number of times it fails. Look around you and discover for yourself the number of people who have had the op and find out what it has been like for them. True it is that a gastric band is a successful way for some people to lose excess weight, but it is relatively easy to cheat and the weight loss may not be any greater than that achieved using a healthy eating plan. Moreover, undergoing surgery to assist with weight loss is not a quick fix. Follow the principles outlined in this NLP book and you can have the benefits of the gastric band without the disadvantages of the surgery and all the horrors that go with it. The authors are therapists who run their own clinics and courses so they are able to write from a professional perspective and from personal experience. The therapies on which the text is based include CBT (cognitive behavioural therapy) as well as NLP (neuro linguistic programming) as well as hypnotherapy. It will enable you to achieve the body shape you want and keep it. You can learn how to make yourself believe your stomach is no bigger than a golf ball and eat accordingly. It will give you motivation and control around food and you will be able to harness the power of the unconscious mind to create a new and better you. 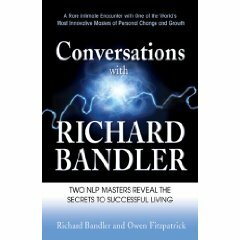 Conversations: Freedom Is Everything & Love Is All the Rest which bears the names, as authors, Richard Bandler and Owen Fitzpatrick is one of the most feel good NLP books you are ever likely to read. Owen Fitzpatrick recounts his conversations with his mentor, Richard Bandler. Owen is an Irish psychologist, psychotherapist and hypnotherapist, and is also an international motivational speaker, author, television presenter and consultant. He was the youngest licensed NLP Master Trainer in the world at 23 and has since trained tens of thousands of people in more than 12 countries. I like to bookmark the important pages in any volume with coloured stickies depending on their relative importance to me. This book is littered with red stick-on tags because there are so many parts I want to go back over and refer to over and over again. You don't need to have read any other NLP books in fact no previous knowledge of NLP is needed in order to understand this very warm and compelling volume. There are sections on the art of personal freedom, the keys to changing your life, breaking the chains of self, the art of loving and the art of spiritual freedom. It is littered with useful exercises which can improve your mental state immediately. They show you, as an introduction, how to achieve mental freedom, how to change, how to design your future and appreciate life and how to motivate yourself. There are many including a very effective self-hypnosis induction. 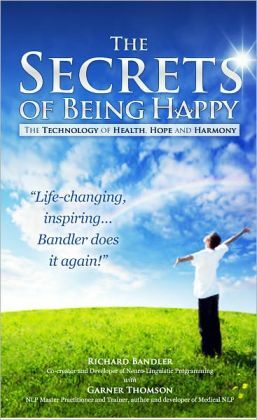 Dr Richard Bandler’s latest book The Secrets of Being Happy: The Technology of Hope, Health, and Harmony is co-authored with Garner Thomson, NLP Master Practitioner and Trainer and developer of medical NLP. It is an active participation book and you will, as I did, want to take part in the exercises in order to achieve maximum benefit from it. Rather than preach NLP it concentrates on using its principles for the reader’s benefit. It is an active participation book and you will, as I did, want to take part in the exercises in order to achieve maximum benefit from it. Rather than preach NLP it concentrates on using its principles for the reader’s benefit. The first chapter explains the four conditions for being happy and is remarkable not only for its explanation but for the unusual and effective exercise which shows the reader how to feel good for no particular reason and how to call up that reason on demand. Realistically, the authors explain that we cannot, in our current environment, live without stress. As they rightly say, the answer is not to quit your job and move to a cabin on Walden Pond. We all need a certain amount of stress to keep us alert and motivated but it is important that we know how to respond to events and to flourish and prosper. This is another volume I keep prominently displayed on the bookshelves and the pages are very well thumbed.